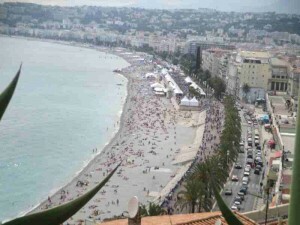 This entry was posted in Travel and tagged Beach, France, Nice on June 2, 2014 by Steve. I’m not really a beach bum. I’m not really into beaches anymore. I used to really like to go to the beach. Anymore, I can take them or leave them. I’m hoping to spend more time at them in the future, but they just really don’t as much for me as they once did. As a child I spent a lot of time at the beach. I lived in Florida and my family camped out at the beach as often as they could. Today, I think I’m more of a mountain guy. I like the trees and the views more than I like the surf. That, however, is open to change. I reserve the right to start liking the beach a whole lot more at any moment. 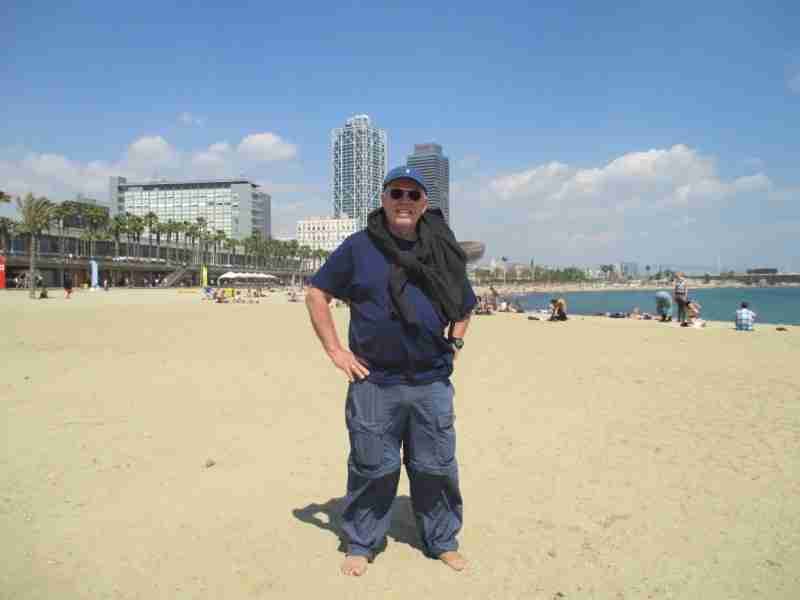 This entry was posted in Travel and tagged Barcelona, Beach, Bum, Spain on April 17, 2014 by Steve. Yes, that’s right. I am a dedicated beach guy. Once in a while. 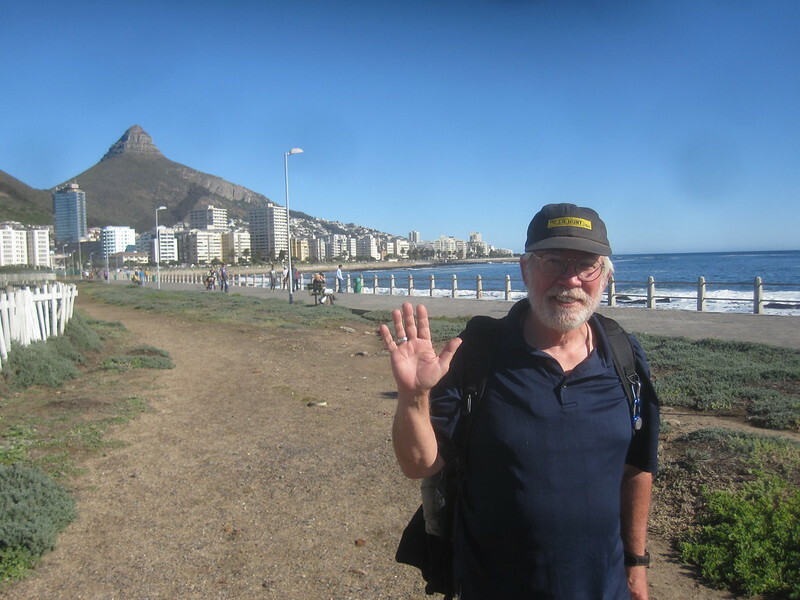 This is me at the beach in Cape Town. I went out to lunch with two friends I met in the city and we went for a walk at the beach. It was a beautiful day in Cape Town. I think winter must be the best season in Cape Town because it only gets cool/cold at night. I’m not sure I would want to be in Cape Town in the summer. I was told it gets hot. However, when I looked at the weather averages at one of the weather web sites, I only see it getting up to around 80 degrees. Could it be that some people in Cape Town have no idea what really hot means? This entry was posted in Travel and tagged Africa, Beach, Cape Town, Overland Trip on July 31, 2012 by Steve. Swakopmund, Namibia advertises itself as the Adrenaline capital of Africa. The reason is that you can participate in adrenaline producing activities such as skydiving, sand boarding, quad biking, and paragliding. Swakopmund is also a beach town and it functions as one of Namibia’s premier places for the locals to go to do some recreational activities. It is also a stop on the overlanding trail for the young to do some skydiving and other activities. Did I skydive? No. My adrenaline is fine. 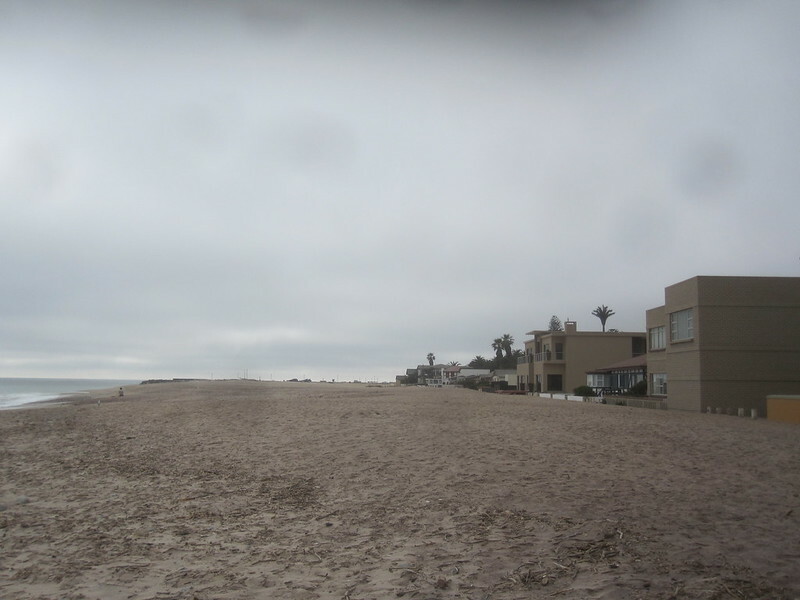 But Swakopmund is a must-see in Namibia. People say the town is more German than Germany. That’s an exaggeration, but you get the point. There are also lots of restaurants in the city. Many more than I found at the bush camps and campgrounds I had been staying in. This entry was posted in Travel and tagged Africa, Beach, Namibia, Overland Trip, Swakopmund on July 21, 2012 by Steve. 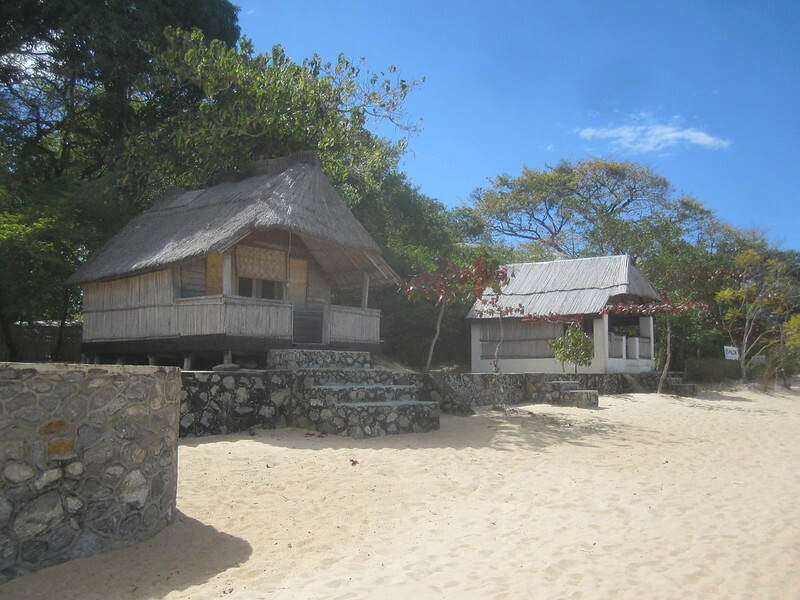 These are the beach bungalows at Kande Beach Campground that is located the beach on Lake Malawi. I could get the privilege of sleeping in one of the bungalows for the paltry sum of $8 per person with an occupancy of two. I wound up sleeping in a tent. The bungalows were cool, sitting on the beach and all, but there were locals who frequented the beach and tried to sell us something, anything actually, and they were quite persistent. The locals were not allowed in the campgrounds where the tents were located and from what I gathered, there wasn’t a lot of advantage to sleeping in the bungalows. There was no running water. There was light bulb and one electrical plug. Only the couples on the trip seemed to need the bungalows for effect. This entry was posted in Travel and tagged Africa, Beach, Malawi, Overland Trip on June 22, 2012 by Steve. This is a view from Kande Beach, our new home for three days. 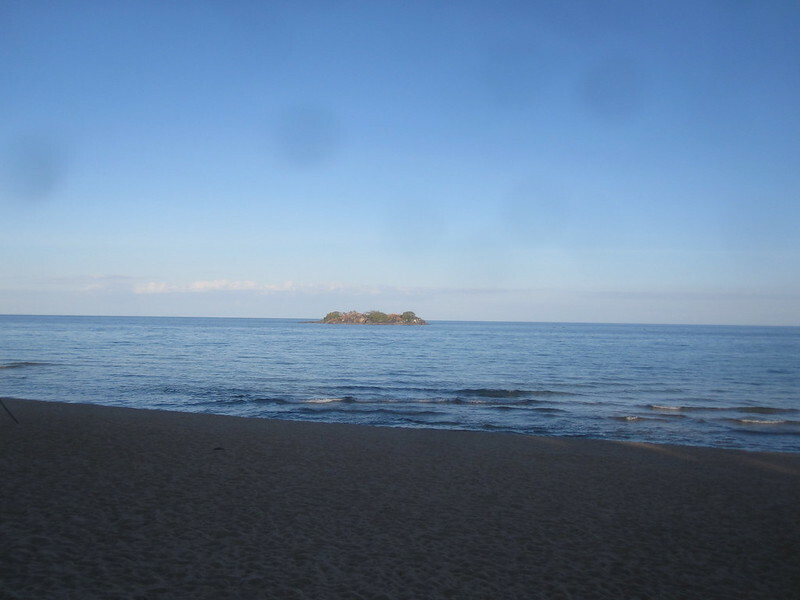 We made this stop on Lake Malawi as it is supposedly a good place for people to do a little fresh water diving. It’s also a place to stop and relax. One thing I’ve seen on this trip is that an overland trip is much different than the normal type of traveling that I do. Usually, I pick a location based on the significant things to see in the area. Generally, I try to find the world’s most significant tourist attractions and go see them. This trip is something of an adventure for me. There aren’t a lot of &quot;The World’s Top Tourist Attractions&quot; on the overland trip I’m taking, although there are a few. This type of trip is about doing a 3,000 mile truck camping trip through Eastern and Southern Africa with a group of 15-20 other people. This trip really isn’t tourism in the traditional sense, something I didn’t think through as well as I should have when I purchased the trip. Yes, I’ve gone on group tours before, but we always stayed on a hostel or hotel not in a tent, and our goals were to see the traditional tourist sites. 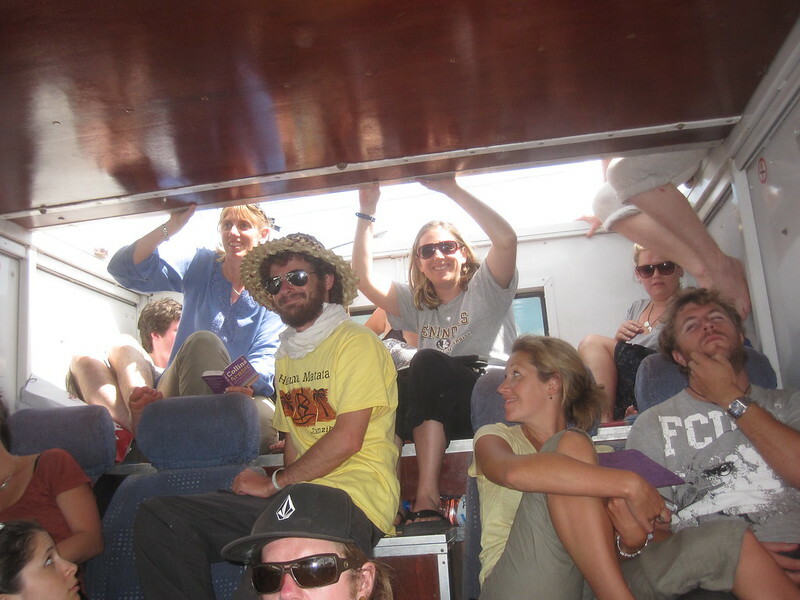 It wasn’t a tour of the campgrounds of Africa and 3,000 miles in the back of truck with a large group of people. This entry was posted in Travel and tagged Africa, Beach, Malawi, Overland Trip, Tour on June 21, 2012 by Steve. This is the beach on the truck. The beach is the place where people stick their heads out of the truck to look where we are going down the road. It’s called the beach because it’s so sunny relative to the other seats in the truck. In this picture we are going through the scales where they weigh the truck and the driver have requested that we all move to a position as close to the front of the truck as possible. That means that a lot of the people are going to be on the beach, which is close to the front of the truck. They look happy, don’t they? That’s because we aren’t going to have to empty the truck, get searched, and fined for being overweight. This entry was posted in Travel and tagged Africa, Beach, Overland Trip, Tanzania on June 21, 2012 by Steve. 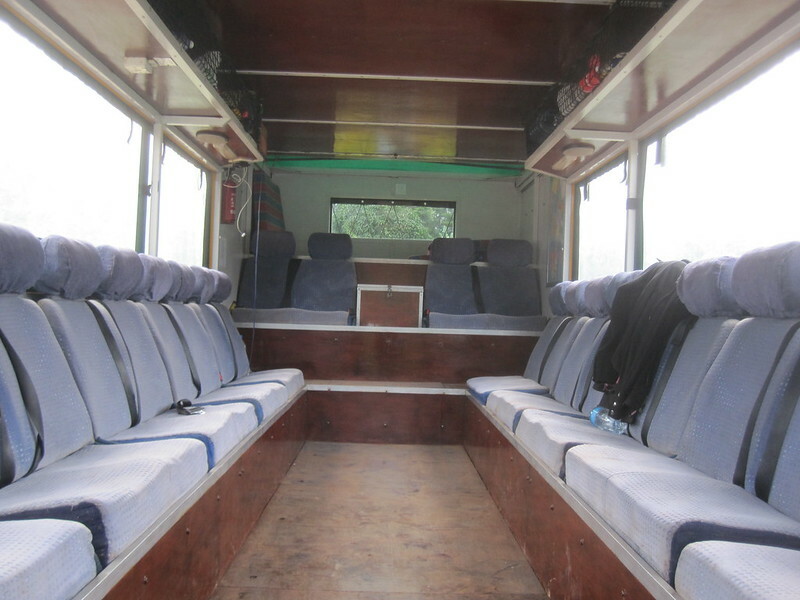 It’s the inside of our overland truck. Oddly, there’s no one inside but me. Notice the layout. It’s very conducive to community. It’s also very conducive to storage. The lockers are located underneath the seats and go down a good 3 feet. I have a 32&quot; duffel that fits in the locker standing up. I share a locker with Tyler, another tourist who hails from Canada. For the storage of our day gear there is a shelf above the seats with netting to keep the day stuff from falling on your head and killing you. The windows are plastic and role up and down with a little help from a few of the passengers. In the front of the area you see is &quot;The Beach&quot;, a flat surface with a window that has the area above it cut out so that people can get on their knees and stick their heads out above the top of the truck to look forward to see what’s going on. It’s called the The Beach because you can get a good sunburn or tan by sitting on The Beach for a whole sunny day with the canvas removed that covers The Beach. The whole setup is designed for maximum community and maximum viewing so that the occupants can role down the road and wave to all the thousands of children that wave at us. This entry was posted in Travel and tagged Africa, Beach, Overland, Overland Trip on June 12, 2012 by Steve. I’m on the beach. It’s a nice beach. Dave and I are checking out the dive shops. I’m pointing to one of the old style boats in the harbor. There were lots of them. Remember, Zanzibzr is an island. Virtually everything that comes here comes on a boat. I sat during lunch the same day and watched a bunch of locals wade into the water and unload all kinds of cargo by hand while he boat was anchored in the shallow area of the beach. 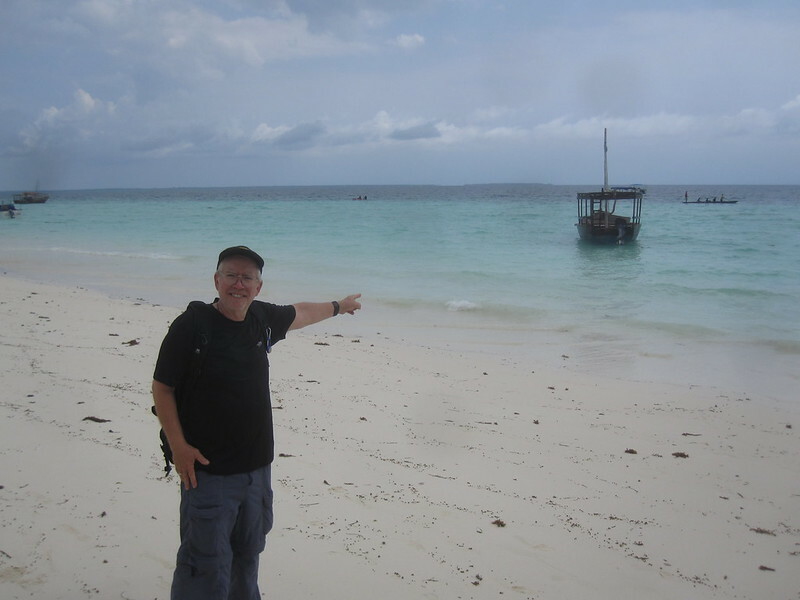 This entry was posted in Travel and tagged Beach, Tanzania, Zanzibar on June 7, 2012 by Steve. It’s the Mekong River in Vientiane. It’s not supposed to look like that. It’s jus that the river is very low. The level of it must change significantly during the year because they have all kinds of retaining walls for the water. The walls that I saw were obviously for the Mekong at another time of the year. 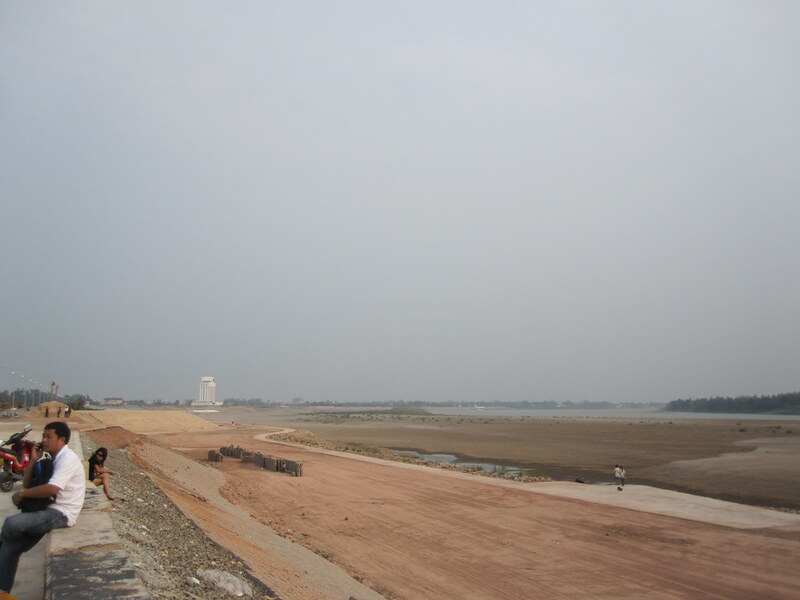 This entry was posted in Travel and tagged Beach, Mekong on March 1, 2011 by Steve.